Saraju Nisha sits at the door of her house, about 500 metres from a mountain of coal mine waste in Chilika Daad village in Uttar Pradesh’s Sonbhadra district. The 60-year-old former miner is in deep pain. For the past five years, she has been suffering from stomachache, joint pain, numbness and excessive salivation. What’s troubling her more is her skin which has discoloured. “All this is due to the overburden mountain created by the Khadia coal mine of Northern Coalfields Limited (NCL),” she says. The company’s waste, or overburden, is at an altitude higher than the village. In August last year, rains brought all the waste down to the village. “At 2 am, we found ourselves waist deep in water. Our houses were destroyed and cattle died,” says Saraju. This is an annual phenomenon, says Manonit, another resident. Health problems like those of Saraju are common in the district. Cases of stillbirths, menstrual irregularities, sterility, hyper-pigmentation, anaemia and high blood pressure are high in the region, say people. “We have been complaining to the district magistrate and the police since 2008 but no action has been taken,” he says. Chilika Daad is a colony of people displaced twice because of developmental activities in the Singrauli region, comprising Singrauli district in Madhya Pradesh and Sonbhadra district in Uttar Pradesh. The region has huge coal reserves and many thermal plants. When a dam was constructed on the Rihand, a tributary of the Sone, in the 1950s, residents were resettled from Renukut to Shaktinagar village. They were resettled to Chilika Daad when NTPC Limited started building its Shaktinagar plant in 1975. They could be displaced the third time as NCL plans to expand its Khadia mine. “When we approach NCL with our problem, it shrugs off responsibility by saying the colony belongs to NTPC. Officials at NTPC blame NCL, saying it is theirs,” says Manonit. 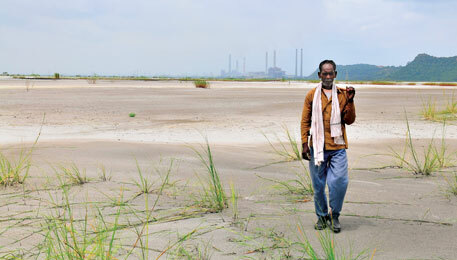 Chilika Daad residents know the coal mines and the thermal plant are the reasons behind their ailments. What they do not know is exactly how it affects them. Mercury is one of the natural, and perhaps the most harmful, components of coal. During combustion at temperature above 1,100°C, it vapourises. Given the large quantity of coal burned in thermal plants, considerable amount of mercury is released into the atmosphere. Some of it cools down and condenses while passing through the plant’s boiler and air pollution control system and enters the environment through soil and water. It also enters the environment through run-off from coal mines. In humans, mercury can cause several chronic diseases and death. How much mercury does coal contain? The answer varies from region to region. The Central Pollution Control Board analysed 11 coal samples from Singrauli and found mercury concentration in coal ranging between 0.09 parts per million (ppm) and 0.487 ppm. In 2011, Delhi-based non-profit Centre for Science and Environment (CSE) had found 0.15 ppm mercury in coal at Anpara village in Sonbhadra. It is estimated that a 1,000 MW thermal power plant is emitting at least 500 kg of mercury every year in Singrauli. In 2011, people approached CSE to study the pollution and health problems in Sonbhadra. The non-profit collected samples of water, soil, cereals and fish from the district, and blood, hair and nails of people living there. Results showed that high levels of mercury have made way into the environment. Nothing at all in Sonbhadra has been spared the devastating effect of mercury, one of the most poisonous elements in nature. It accumulates in living organisms and magnifies over time. Chronic exposure to mercury can affect the nervous system and cause loss of memory, severe depression, increased excitability, delirium, hallucination and personality changes. It can also damage the kidney. The pollution monitoring laboratory of Delhi-based non-profit Centre for Science and Environment picked up six categories of samples. Nineteen people facing health problems were selected for blood, hair and nail samples from Sonbhadra. Twenty-three samples of water, a mix of groundwater, surface water and effluent, were collected from different places in the district. Seven soil samples were taken. Five samples of rice, wheat and pulses grown in the area were collected from different houses. Three fish samples were collected from different places in the Gobind Ballabh Pant Sagar (GBPS) reservoir on the Rihand. Blood, hair and nail samples were tested for presence of mercury. Water and soil were tested for mercury and other heavy metals like lead, cadmium, chromium and arsenic. Water’s physico-chemical properties, like hardness and total dissolved solids (TDS) content, were also studied. Cereal samples were analysed for heavy metals. Fish were tested for methyl mercury, the most poisonous form of mercury. In aquatic medium, mercury tends to convert to methyl mercury. The samples were examined using advanced equipment and internationally accepted methods (see ‘Methodology’). Mercury enters the human body with food or water through the gastrointestinal tract or as vapour in the atmosphere through breathing. Laboratory tests revealed presence of an average 34.3 parts per billion (ppb) mercury in the blood samples of 12 women and seven men whose age ranged between eight and 63 years. This was six times the safe limit of 5.8 ppb set by the United States Environment Protection Agency (USEPA). The blood samples were collected from Chilika Daad, Dibulganj, Khairahi-Kirwani and Obra villages. The highest concentration of 113.48 ppb was found in the blood of Kailash of Khairahi. He eats fish thrice a week and complains of burning sensation in the limbs, a strange electrifying feeling in the body, joint pain and muscular spasms. The second highest mercury content, 78.68 ppb, was found in the blood of Saraju Nisa of Chilika Daad, a fish lover. Mercury was found in the blood samples of all men and 75 per cent women. It ranged from 26.23 ppb to 113.48 ppb in men and from 10.31 ppb to 78.68 ppb in women. According to Health Canada, the country’s health department, less than 6 parts per million (ppm) of mercury in hair is safe. Between 6 ppm and 30 ppm, it is in the “increasing risk” category and in the “at risk” category if it is above 30 ppm. CSE’s lab found that 11 of the 19 hair samples, which is more than 57 per cent, had mercury content ranging between 1.17 ppm and 31.32 ppm, an average of 7.39 ppm. Twenty-six per cent of the samples had mercury between 6 ppm and 30 ppm, putting them in the “increasing risk” category, and about 11 per cent were in the “at risk” category with more than 30 ppm. The highest amount, of 31.32 ppm, was found in the hair sample of Abrania Sobran of Dibulganj. She complains of burning sensation in abdomen, tingling sensation, muscular spasms and joint pain. The second highest concentration of 30.65 ppm was found in eight-year-old Himanshu Prasad of Chilika Daad. He has been a diabetes patient since he was a year and a half. Concentration of more than 20 ppm mercury in hair can give vertigo, dizziness, headache, pain in the limbs and reduced vision, states the World Health Organization. The average concentration of mercury in the hair of men and women was 7.27 ppm and 7.45 ppm respectively. No standards or guidelines exist for mercury in human nails. In 44 per cent nail samples, mercury was detected in the range of 0.16 ppm and 7.02 ppm. Its average concentration was 0.83 ppm. Highest amount of mercury, 7.02 ppm, was found in Lata Devi of Chilika Daad. The average concentration of mercury in men’s nail samples was 0.22 ppm. It was 1.22 ppm in women. CSE tested the physico-chemical properties and heavy metal content in the groundwater from hand pumps and the water supplied by companies and the government to households. Mercury was found in groundwater samples, but not in the supply water. It ranged between 0.003 ppm and 0.026 ppm in 20 per cent of the samples. In water drawn from a hand pump at Dibulganj, it was 0.026 ppm, 26 times the desirable limit of 0.001 ppm set by the Bureau of Indian Standards (BIS). Water from a well at Anpara and from a hand pump at Chilika Daad had 0.008 ppm and 0.003 ppm of mercury respectively. Anpara, Dibulganj and Chilika Daad are situated close to thermal plants or coal mines. High mercury content in groundwater here could be because of burning huge quantities of coal in thermal plants and mercury leached from extracted coal. The drinking water samples showed high calcium, hardness and TDS content. In 80 per cent drinking water samples, fluoride ranged between 0.1 ppm and 2.1 ppm. In two samples from Kushmaha village, it was between 2.1 ppm and 1.8 ppm, double the desirable limit. Though both were from the same hand pump, one was filtered and the other was not. Filtered water had 389 ppm hardness and 80 ppm calcium. Unfiltered water had 335 ppm hardness and 48 ppm calcium. Exposure to hard water may exacerbate eczema, a skin disorder. In 2009, the Uttar Pradesh government had fitted filters in hand pumps to remove fluoride. The test results show that the filter is not very effective, perhaps because of poor maintenance. Two surface water samples were collected from Rihand dam, where Dongiya Nallah meets GBPS reservoir, and one was collected from Obra dam. The caustic soda manufacturing unit of Aditya Birla Chemicals Limited (ABCL) releases its effluent in Dongiya Nallah. Caustic soda requires, among other chemicals, mercury during the manufacturing process. ABCL claims that after it took over from Kanoria Chemicals it changed its technology that does not require mercury. However, 0.01 ppm of the toxic metal was found in the water from the Rihand dam. Water from Obra dam had 1.8 ppm fluoride, higher than the permissible limit of 1.5 ppm prescribed by BIS. Two of the three samples had 0.019 ppm arsenic. Water of the Renuka at Obra had 0.008 ppm arsenic. The Rihand changes its name to Renuka here. Thermal power plants of Uttar Pradesh Rajya Vidyut Nigam Limited discharge fly ash slurry into the Renuka. The river has high concentration of arsenic possibly because of fly ash from the coal burnt in thermal power plants. The Environment (Protection) Act of 1986 prescribes the maximum mercury level in effluent as 0.01 ppm, maximum arsenic level as 0.2 ppm and not more than 2 ppm fluoride. Two of the five effluent samples tested had fluoride. Water of Dongiya Nallah had 4.5 ppm fluoride and 0.127 ppm mercury. Effluent from ABCL had 4,370 ppm TDS, more than double the standard of 2,100 ppm. It also had 4.5 ppm fluoride and 0.127 ppm mercury. Clearly, ABCL is a major polluter of the GBPS reservoir. Mercury in all seven soil samples was in the 0.42-10.09 ppm range. The highest concentration of 10.09 ppm was found in the soil collected near Dongiya Nallah. Soil from Anpara, Chilika Daad and Obra had 1.64 ppm, 1.75 ppm and 0.42 ppm mercury respectively. Others had between 0.50 ppm and 0.57 ppm mercury. All seven samples had arsenic in the 0.52-7.67 ppm range. Maximum of 7.67 ppm was found in Khairahi’s soil. Dongiya Nallah’s soil had 6.36 ppm arsenic. Lead was present in 10.4-35.1 ppm range in 86 per cent samples. Maximum of 35.1 ppm lead was found in the soil collected from the spot where Dongiya Nallah drains into the Rihand reservoir. Chromium was in the 11.5-41.6 ppm range. There are no standards for heavy metals in soil in India. Food Safety and Standards Authority of India has set 0.25 ppm as the standard for methyl mercury in fish. CSE collected two samples of rohu (Labeo rohita) and one of malli (Wallago attu), both commonly available fish, from different locations in the GBPS reservoir. Methyl mercury was found in both the rohu samples. The highest concentration of methyl mercury, 0.505 ppm, was found in rohu collected from Shaktinagar near Baliya Nallah. This is where effluent from NTPC Limited and coal mines in the surrounding areas is discharged. The other rohu sample from Dongiya Nallah had 0.447 ppm of methyl mercury. Malli fished from Belva Dah did not have methyl mercury. A large part of the population in Sonbhadra eats fish. India has set 1.1 ppm as the permissible limit for arsenic in food items. A human carcinogen, arsenic gets accumulated in cereals. CSE tested two samples each of wheat and rice and one sample of mixed pulses for lead, cadmium, chromium, arsenic and mercury content. Mercury and lead were either not detected or were present in very low amounts. Sixty per cent of the grain samples had arsenic in the 0.042 ppm-0.173 ppm range. Maximum arsenic, 0.173 ppm, was found in rice. Arsenic levels in the three samples were within the Indian permissible limit. Chromium was found only in rice of Kirwani village—1.6 ppm. Twelve-year-old Sonia Kumari of Kirwani village faints often. She is scared and wonders what’s happening inside her. Her parents took her to a doctor, but he could not pinpoint a reason for this. Sanjay Kumar, 9, of Garbandha village, is worried because his skin has developed white patches in the past one year. “My friends say I look different,” he says. Sanjay’s father, a farmer, spends a large part of his earnings on medicines. “His condition has not improved. We do not know what to do,” he says. The problems compound with doctors not associating mercury with people’s sufferings. After CSE’s laboratory tests on mercury, the non-profit surveyed 64 people between two and 70 years from Sonbhadra. The survey found high incidence of vitiligo, or skin discolouration, shivers, respiratory illnesses, joint or abdominal pain, reduced vision, burning sensation in the limbs and impaired language skills. All these are known to be symptoms of mercury exposure. The results found that a huge number of people in Sonbhadra suffer from these. In 1998, Indian Institute of Toxicology Research (IITR), Lucknow, conducted an environmental epidemiological study in the Singrauli region. During the study, over 1,200 people were examined and it was found the mean mercury level in their blood was significantly high. Sixty-six per cent of the people examined had more than 5 ppb mercury in their blood. Mean mercury in hair was also significantly high. The study also tested vegetables, drinking water and fish in the area. The incidence of acute illnesses like diarrhoea, dysentery and respiratory infections is very high in Sonbhadra, much more than in any other district in Uttar Pradesh. The annual health survey of Uttar Pradesh conducted by the state government in 2010-11 shows that 30,664 people get affected by such illnesses per 100,000 people. This is two-and-a-half times the state average for acute illness—12,561 people per 100,000 population. Sonbhadra also reports maximum cases of chronic illnesses like diabetes, hypertension, tuberculosis, asthma, chronic respiratory diseases and arthritis in the state. As many as 17,000 people per 100,000 people show the symptom of at least one chronic illness. The state average is 8,380 per 100,000 people. Hypertension in the district is also higher than in most districts—686 per 100,000 people. 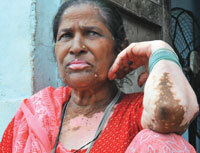 Close to 400 per 100,000 people suffer from tuberculosis in the district. Asthma figure stands at 679 per 100,000 people and arthritis at 2,938. Twenty-three per cent of the vegetables had mercury levels higher than the permissible limit, while 15 per cent of the drinking water samples had mercury more than the permissible limit of 1 ppb. The mean mercury level in fish was significantly high. According to the study, women here suffer from headaches, menstrual irregularities, stillbirths, sterility, numbness and tingling sensation in the legs. Hyper-pigmentation, anaemia and high blood pressure were also seen in some cases. “The IITR study was never made public and the government did not take any action,” says Jagat Vishkarma, of non-profit Banwasi Sewa Ashram. The CSE study has found even higher levels of mercury exposure in the area showing clearly the sign of inaction. Ragini, a 75-year-old doctor practising in Sonbhadra for the past four decades, says cases of muscular weakness, menstrual irregularities, difficult deliveries and diabetes are rising. The need is to generate awareness about the possible sources of mercury and find ways to prevent exposure to it, she says. “Medical facilities at the division hospital are dismal. It has only three doctors for about 250 patients in a day,” says a medical officer at Myorepur division hospital, who did not want to be named. The hospital has only 30 beds. R A Yadav, chief medical officer of district hospital at Robertsganj, blames the district’s geographical setting for the dismal facilities. “The distance between villages and primary health centres is very long. Twenty-two employees were transferred from the hospital, but only seven have been replaced,” he says. No surprise then, Sonbhadra ranks poor in the state government’s health survey as well. Non-compliance is the norm in Sonbhadra. Companies operating in the district are notorious for flouting rules. Most thermal power plants, for instance, simply dump their waste in fly ash ponds or as huge mounds. As per government regulations, all the fly ash produced in thermal plants should be utilised, whether in brick kilns or in cement manufacturing units. NTPC Shaktinagar dumps its fly ash in an open area. Cattle easily find way to this area, drink it and develop diseases later. In summers, fly ash reaches Gobind Ballabh Pant Sagar (GBPS) reservoir along with the wind. Thermal power plants in Anpara discharge fly ash slurry into the reservoir. The coal mines of NTPC Shaktinagar and its surrounding areas discharge their fly ash slurry into Baliya drain, which then meets the reservoir. Some power plants collect fly ash as huge mounds, leading to accidents. The Hindalco aluminium plant in Renukut has a captive power plant. It has been dumping fly ash within its premises for years. On August 28, last year, the fly ash mound came crashing down, killing two workers. “A similar accident had occurred in the plant killing scores of people in 1996,” says Lokendra Mishra, a resident. The plant produces 900 tonnes of fly ash every day, states the State Pollution Control Board (SPCB). “It has been storing fly ash in one hectare for the past decade. Possibility of an accident is, therefore, high,” states an SPCB inspection report. “Following the accident, the pollution control board served the company show-cause notice and asked it to build a high wall around the place where it stores fly ash,” says Kalika Singh, regional officer of SPCB. Almost a year later, only a small portion of the wall has been built. It’s a similar situation in Obra. All power plants here have been disposing of fly ash into the Renuka for years creating a thick layer of fly ash slurry on the river’s surface. “We eat fish from this river,” says resident Manik Chand who has a lower body deformity. Manik has been living in Obra for the past 40 years. Many residents have moved court (see ‘In court’) and await action. In 2000, environmental lawyer M C Mehta filed a petition in the Supreme Court complaining about mercury pollution in the Rihand, a tributary of the Sone. The petition was clubbed with the Ganga pollution case, also filed by Mehta. Sone is a tributary of the Ganga. The Uttar Pradesh Pollution Control Board (UPPCB) replied that mercury levels were not high either in the river or in Singrauli region. The court ordered UPPCB to take samples from the area and get laboratory tests done to establish the status of mercury contamination. Kalika Singh, regional officer of UPPCB, says mercury levels in Sonbhadra is checked from time to time. “We have not found high mercury level in water,” he says. The court also asked the Central Pollution Control Board (CPCB) to assess mercury pollution in the area. In 2002, CPCB sponsored a project to Singrauli-based non-profit Banwasi Sewa Ashram to monitor heavy metal and other pollution parameters in soil and water. The study found high concentration of mercury and fluoride in air. The highest concentration of mercury in water was found in Dongia and Baliya nallahs. In the same case, the court recognised in 2007 that Singrauli has a large number of power plants and aluminium, chemical and cement industries that may be causing large-scale mercury pollution. Mercury in drinking water and edible substances may be in high percentage causing serious health hazards. In December 2007, court again directed CPCB to submit its latest report on environmental quality in Singrauli region. J S Kamyotra, member secretary, CPCB, says the board has not done an extensive study on mercury in Singrauli. Thermal plants do not meet stack emission norms either and cause air pollution. Stone crushing units in the area also cause heavy air pollution. “In summers, it is difficult to see beyond 10 feet,” says Jagat Vishkarma of Sonbhadra-based non-profit Banwasi Sewa Ashram. The air is thick with coal dust and fly ash near the coal storage of NTPC-owned power plant in Garbandha village. Small wonder, cases of respiratory diseases in the region are high. In the past two years, five persons in the village have died of acute asthma, say residents. “We gave our land at throwaway prices because NTPC promised us employment. We never got any work. The company has polluted the environment. We do not have fresh air or clean water,” says Ram Prasad Baiswar of Garbandha. A 2002 estimate by the Central Pollution Control Board (CPCB) states that 17 per cent of the country’s thermal plant mercury emissions are from the Singrauli region. In 1998, Banwasi Sewa Ashram measured mercury in Singrauli’s air. Stack samples of Anpara thermal power plant, Hindalco Industries, Singrauli power plant, Hi Tech Carbon and Obra power plant reported mercury release. Obra thermal plant’s stack showed high mercury emission of 0.64 mg/Newton metre cube (Nm3), followed by Anpara power plant which showed 0.16 mg/Nm3 mercury emissions. The total mercury concentration in the air in the region was between 0.03 mg/Nm3 and 0.05 mg/Nm3. The study found 4.54 ppb of mercury in Dongiya drain, which flows into the Gobind Ballabh Pant Sagar reservoir. A pungent smell hangs around the drain carrying reddish brown effluent. People have no option but to use this water for washing clothes, cattle and at times even for taking bath. The CSE study also indicates high levels of mercury in Dongiya drain and attributes this to the contamination caused by Aditya Birla Chemicals Limited’s plant. In 2009, CPCB and the environment ministry, in collaboration with Indian Institute of Technology-Delhi, released a comprehensive environment pollution index for 88 industrial clusters in the country. They calculated the pollution index for air, water and land. After the results, the environment ministry declared Singrauli the ninth most critically polluted area in the country. It imposed a moratorium on any new project or expansion of present projects. It told the states that the moratorium would be lifted only after submission of action plans that would aim to reduce pollution levels in the region. The action plans submitted by the pollution control boards of Madhya Pradesh and Uttar Pradesh were weak. There was no push to reduce pollution levels in the region. The plans gave directions like 100 per cent utilisation of fly ash, meeting stack emissions norms and ensuring monitoring for air pollution. These, however, are government regulations that companies must adhere to. Also, despite Singrauli being a contiguous area falling in two states, the environment ministry did not ask the two state pollution control boards to prepare a combined action plan. Following pressure from the state government and the industry, the environment ministry lifted the moratorium in July 2011. With no holds barred, companies are now aggressively planning projects to set up power plants and mine coal. 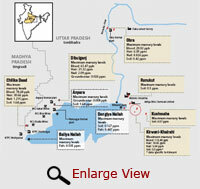 Resource-rich Singrauli is witnessing industrialisation at break-neck speed. With a massive 1,062 million tonnes of coal reserves, the region had remained unexploited till 1962, when the Gobind Ballabh Pant Sagar (GBPS) reservoir was built on the Rihand river. The reservoir proved to be the second biggest attraction for industries. Companies, mostly thermal power plants, are in a rush to acquire land there by hook or by crook. Mahan Coalfields Limited, a joint venture of Essar and Hindalco, wanted 1,000 ha forestland that fell under the environment ministry’s no-go zone. It applied for diversion. A group of ministers recently cleared the land for mining. With 10 thermal power plants, Singrauli’s coal-based thermal power capacity stands at about 13,200 MW. And with 14 coal mines, it has a coal mining capacity of 83 million tonnes per annum (MTPA). Most of the coal mines are owned by Northern Coalfields Limited. Besides, the area has aluminium smelting plants, chemical industries, cement industries and other industrial and commercial operations. Singrauli is set to get another 50 MTPA of coal mining capacity and another 9,600 MW of thermal power capacity. This proposed industrialisation would need 7,600 hectares (ha) and 120 million tonnes of coal. The region would generate more than 50 million tonnes of fly ash, close to half a million tonnes of suspended particulate matter (SPM) annually and more than a million tonnes each of oxides of sulphur and oxides of nitrogen. Already branded the country’s energy capital, Singrauli’s existing and planned power plants will together need 880 million cubic metre of water per year, enough to meet the domestic water requirement of more than 80 million people. GBPS is a potential water source for all thermal power plants in the area. Sonbhadra is, therefore, water stressed. District magistrate Suhas L Y says government had planned to provide hand pumps across the district, but it was not implemented. “Now, we have set aside Rs 3.5 crore for the purpose. 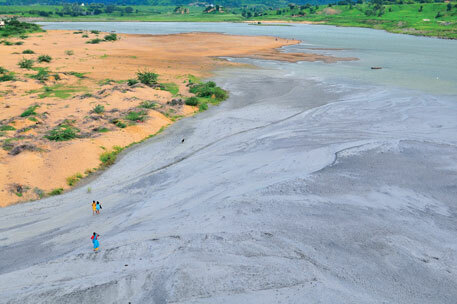 Had the GBPS reservoir not been polluted, there would have been no water shortage,” he says. Even the action plan that the Uttar Pradesh government submitted to the Union environment ministry states that water will not be provided for stone crushing operations. As per the 2011 census, Sonbhadra has a population of 1,862,612 and a population density of 270 (number of people per square km). More than 85 per cent of Singrauli’s thermal plants and coal mines are in Sonbhadra. Despite this, the state of basic amenities in the district are dismal. Only 29 per cent of the total 327,000 households have electricity. The district has 18 per cent urban and 82 per cent rural population. While a substantial 83 per cent of the urban households have electricity, only 17 per cent of the rural households have light. The state of drinking water is no better. Only 22 per cent of the total households in the district have drinking water source within the house, 44 per cent have the source close to their houses, while 30 per cent houses have drinking water source far from their houses. Only 13 per cent households get treated tap water; 62.6 per cent depend on hand pumps, water of which is contaminated with fluoride, arsenic and mercury. Residents have slowly started recognising that development in the district is not reaching them. On August 24, scores of people gathered in Babhani village to protest the upcoming 1,980 MW power plant of the Uttar Pradesh Power Corporation Ltd. The area is dominated by Gond, Kharwar and Panka tribes who do not want to give away their land for the plant. “Close to 500 households will get displaced by this plant. We cannot let that happen,” says Vijay Singh Gond, seven-time MLA from the area. “Coal mines and power plants have already destroyed Sonbhadra. Earlier, industrial activity was centred around the GBPS reservoir. But now, industrialisation is spreading.” The Babhani plant proposes to draw water from the reservoir through a 30 km pipeline. “They have already polluted our water, air and affected our health. What more do they want?” asks Gond. The mercury time bomb is ticking in Singrauli. What’s the way out? It took a quarter of a century from the time Japan’s chemical firm Chisso Corporation started dumping methyl mercury into the Minamata Bay in 1932 to identify Minamata, a neurological disease caused by mercury poisoning. Methyl mercury accumulated in the fish of Minamata Bay, which people used to eat. Thousands suffered from the disease and died. Animals, too, were not spared. The disease was also named the dancing cat fever because of the strange behaviour in cats who were seen to have convulsions, go mad and die. It took another half a century for the victims to be compensated. The compensation claim against Chisso Corporation continues. It was only in 2004 that the company was ordered to clean up its contamination. What happened in Minamata has an important lesson for Singrauli. The knowledge about mercury pollution in Singrauli’s environment—land, water, soil, food commodities and even people—is not new. Way back in 1998, the Indian Institute of Toxicology Research (IITR), Lucknow, a constituent laboratory of Council of Scientific and Industrial Research, undertook one of the biggest mercury contamination studies in Singrauli. The results were devastating. The study found high levels of mercury everywhere. It also found that people in Singrauli had diseases and showed symptoms that could be directly linked to mercury poisoning. But the study never made it to the news because it was never publicly released. IITR, a government institution, refuses to give the data even today because the study was sponsored by NTPC Limited, also a government-owned company that has many thermal power plants in Singrauli and plans many more. Singrauli comes under the scrutiny of the country’s highest court as well. The Supreme Court has recognised and passed orders on mercury pollution in Singrauli. The Central Pollution Control Board (CPCB), following the orders of the Supreme Court, monitored and found high levels of mercury in the air in Singrauli. It, however, did little. As late as December 2007, the Supreme Court asked CPCB to submit reports on mercury pollution. But the case has been put on the back burner. In 2009, Singrauli was declared as the ninth most critically polluted area and a moratorium was imposed on projects. However, the action plans submitted separately by the Madhya Pradesh and Uttar Pradesh pollution control boards do not even recognise that mercury contamination is a serious problem in Singrauli. They do not even recognise that more than 10,000 MW coal-based power plants and an additional tens of millions of tonnes of coal mining projects are in the pipeline. Based on the shoddy action plan, CPCB and the Union Ministry of Environment and Forests (MoEF) removed the moratorium. Since then it is business as usual. There is no one to monitor implementation of even the shoddy action plans. There is a long queue of companies that plan to set up power plants and mine coal from this resource-rich but cursed area. Industries behave as if there is no tomorrow. People have no option but to suffer. In the electricity capital of India, they have no electricity, no clean drinking water and no employment. What they do have is pollution, disease and poverty. Singrauli is a classic case of government apathy and industry’s callousness. It is also a classic case of the conspiracy of silence. The government and industry know that mercury is poisoning people and the environment of this area, but they do not want to talk about it. When community representatives of Singrauli approached us to take up the issue, we frankly had little to add as far as facts about mercury pollution were concerned. The facts were established long back. Nevertheless, we decided to undertake the laboratory study. What we found has shocked us further. There is clear evidence of increasing contamination in Singrauli. Our study shows that contamination levels have increased significantly from what was found by IITR and other studies. Our worry is that if no action is taken now, the contamination will increase further. Let me explain. At present, there are coal-based power plants of 13,200 MW capacity and 83 million tonnes per annum (MTPA) of coal mining capacity in the area. A study by CPCB on Singrauli coal indicates that mercury in the coal ranges from 0.09 to 0.487 ppm. CSE’s test on coal samples from Anpara power plant shows mercury content of 0.15 ppm. This means that anywhere from 15 tonnes to 50 tonnes of mercury is being released into the environment every year by the power plants. Add to this mercury emissions from the caustic soda plant of Aditya Birla group. We are not even considering mercury emitted from coal mines, which could be considerable. Now, there is already 9,600 MW power plant and 50 MTPA coal mining in the pipeline. When they start operating, which they will, an additional 10-40 tonnes of mercury will be added to Singrauli’s environment every year. In the not so distant future, we could have 25-90 tonnes of mercury released into the environment of Singrauli every year. We have a mercury time bomb ticking in Singrauli. If we allow this to happen, we will be repeating the mistakes of Minamata. The only difference is that Minamata had population in thousands and in Singrauli it is in millions. So, what can we do to defuse this time bomb? The government must recognise and accept with all seriousness that it has to solve the mercury pollution problem. The conspiracy of denial and silence must end. Second, the moratorium must be reimposed on Singrauli to develop a future course of action. During this period, the government should commission a cumulative regional impact assessment and carrying capacity study to assess how many coal-based power plants, coal mining and other industries this area can sustain depending on the assimilative capacity of the environment. This assessment must give primacy to water and mercury pollution. Third, mercury standards must be set for coal-based thermal plants, coal washeries and mining. All existing plants and upcoming plants must have state-of-the-art mercury control system. Old plants that do not meet standards should be shut down. The system for regular mercury monitoring and advisory must also be put in place. Apart from inhalation, a major source of mercury intake by people is through food, including fish and water. These must be regularly monitored and if mercury in them is found beyond the acceptable limit, people must be advised not to consume them. For this, a massive information campaign must be started. Our study has found that treated water supplied by the industry or government has less and in some cases no mercury. Treated water must be provided to all hamlets, villages and towns in Singrauli, and the polluting companies must pay for it. India needs to understand this before it is too late. Kudos to Sugandh for the expose. People are dead against nuclear energy in India, while they remain blissfully ignorant about the perils of thermal power. If we have to develop we need power. It is easier said than done to install solar and wind power as both of them need acres and acres of land to generate power-from where do we get land from! The future technology may be able to reduce the size of the solar panels considerably to make them much less land invasive. But till then what do we do? The protagonists of Ganga are shouting hoarse to stop building dams across Ganga in Uttarakhand, about the nuclear energy protests the lesser said the better. But if you take a world statistics you find that minimum number of humans have suffered from radiation accidents from nuclear plants-but since we are scared of their use, we generate a hype about it. People may not agree with me but I still feel and reiterate that for the present a nuclear option is the best option to supplement our power generation and in future as soon as solar panel designs are improved we should change over to solar power. As far accidents are concerned then we should be more scared of the domestic gas and the match box in our pockets! Really alarming,stunned to note that mercury levels in Fish of Rihand reservoir is high. But more samples from different places should have been taken to ascertain it. u.P Government is going to establish a mega-fish cage culture project there-In context to your survey report concerned stakeholders must think twice to begin this mega fishery project over there. Ah! This is horrifying to know. How can the government be quite about all of this. Mercury poisoning is one of the world calamities that can occur in an area. The government must be ashamed! Solar needs acres and acres of land? Quite the opposite. We can at least begin with rooftops, as have so many other parts of the world. Even micro-solar now costs about Rs 150,000 per kW. Enough examples abound in India as well. Gas too is a much cheaper option than nuclear. We can discuss 'statistics' only if the data is given out; as of now nuclear power installations are a state secret. Instead of just accepting what politicians and lobbyists want us think, let's not overlook the fact that North America and Europe have put up a stop to nuclear, while it's mostly the third world gullibles like India that are rushing in. Industrial holocausts, when they happen, have horrific scopes and consequences: Chernobyl was no domestic gas cylinder explosion or firecracker; neither was Bhopal, for that matter. Well, I am not against Solar power or in favour of nuclear Power. My contention is that any source of energy is full of risks. Secondly the cost of generating solar power and its maintenance cost as of now are not favourable for large scale production. Our Nuclear Plants are not a state secret, but yes entry is regulated to keep a check on the visits of unscruplous elements and also for the reasons of human safety. This I am telling you after a recent rip to one of the power stations, where a detailed study was made of the precautions against hazards etc. Still I am not praising all that, because a hazard is something that can not be predicted, only precautions can be taken. My main argument is what do we do? Nuclear is hated by us for reasons best known to us, Thermal power problem has already been enumerated in the article. The lobbyists against dams are saying no no to hydropower-then what is the alternative? Power generation is in the hands of the Government and we can only cry hoarse here, but we cant veto a particular mode of power generation. Mind you Sir, in the government every one is not dishonest and also before launching sensitive projects lots and lots fo studies are done. But I agree that failures and accidents do happen even then. With forest clearance given for Mahaan coal block, situation will worsen once pristine forest gives way to a coal mine. Singrauli district which till about 50 years ago was a land having some of the most dense forests in India is now has been reduced to dusty coal patch and its famed greenery is now fragmented and on its way to total destruction. Thank you for posting. For me it was very important to bring forth the point that thermal power plants do have issues on a number of accounts but as far as mercury goes we do have control technologies available. The sad part is no one in India is using these as no one is bothered. For companies to take mercury seriously, there need to be government mandated standards for mercury. Only then can we expect the companies to work towards reducing this toxin. Renewable energy sources are a welcome change but even these need to be planned carefully. It should not be a situation like Sonbhadra where already some 13,000 MW of power capacity has been stalled and many more is planned. The poor planning essentially exhibits a lack of understanding of cumulative impact of such power capacity in one district on the environment and people. I appreciate your comment. This is a preliminary study and I agree that more comprehensive sampling is needed to obtain very robust and accurate results. I do hope the UP government will take heed and carry out the extensive study soon especially with the mega fishery project planned. It is indeed horrifying to know that the government has been silent about such a serious problem which can have devastating impact if left unchecked. The reason that the people have not yet raised voices I believe is because the effects of mercury exposure take a while to appear. Let us hope his study will stir a few governmental thought processes in the right direction. I could not agree more with you. 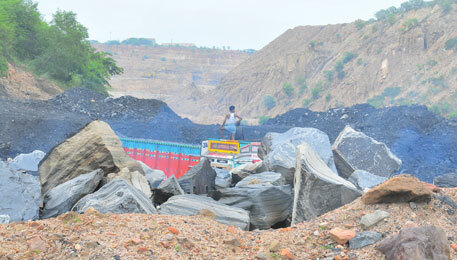 With Mahan now being opened for coal mining the other adjoining areas will also go one-by-one. I guess the government could not resist Essar and Hindalco. But the bigger question to ask is how much coal do we really need? Welcome Sugandh and once again I congratulate you for the efforts you made in bringing the facts before the readers. Yes I know about the techniques, but alas, we hardly care for the safety of the populace. Wish your efforts bring results! It is the (DTE, 31st Oct. It is the (DTE, 31st Oct. 2012 on IndiaÃ”Ã‡Ã–s Minamata) clear cut violation of balancing the availability and exploitation of natural resources. It is the model of Business to Business (B2B) with out bothering for the health & wealth of the People & Environment. This is one of the key reason for apposing the developmental works by the affected PAPs in general and particularly the mining of natural resources. The need of the hour is to shift towards Business to People (B2P) by balancing the quantity & mode of exploitation of natural resources with the health & wealth of the People & Environment. Technologies like: Geological, Geophysical including the GIS & GPS are well established and proven their utility at all the stages covering: mapping, planning, exploitation, monitoring, evaluation with matching scope for taking measures at the right time which expects to save time, energy and money. Finally, the whole process is in the hands of the people and can be planned effectively for keeping the balance between the exploitation of the natural resources and the health & wealth of the People & Environment. I have been associated in this process covering major part of our Country and now associated with the community for creating sustainable solutions. Mercury is not the only pollutant from fossil fuel plants (FFPs). The main pollutant is CO2, for which there is no proven technology available as remedy. The effects of global warming are and will be more disastrous and long/centuries-lasting, as against the radiation hazards from nuclear power stations. The more harmful radioactive elements like Iodine have very short life, while those that last for thousands or billions of years give very minimal radiation in say the 100 years of human life span. The spread of these is also on very limited geographical scale as copmared to the global warming effects of FFPs. Also the pollutiion from the FFPs goes on for 24 hours, day in and day out, during normal working of the plants, no accident being necessary, while the radiation hazards from NPSs occurs almost only after an accident. Such accidents are rare and are getting rarer as the technology improves. Environmental activists like Down To Earth are harming the environment by opposing these plants.